Thanksgiving is a “brand” with all the essentials of any other brand. It has a compelling popular brand story (even if not entirely accurate). European Pilgrims are saved by Native Americans who provide a feast of turkey, corn, and vegetables, for which the pilgrims give thanks for a safe passage and rescue. The turkey, the pilgrim hat, and the cornucopia. It has a brand promise. It has its own brand colors. The colors of harvest: gold, orange, red, green, and brown. Thanksgiving has been a national holiday since 1863, falling on the 4th Thursday in November, approximately one month before Christmas. George Washington established the first national Thanksgiving day with a proclamation in 1789. This is to set aside a day to give thanks for our survival as a nation, the blessings we enjoy, and the establishment of self-government. Considering what the settlers did to the Native Americans, it’s easy to understand why the day is not without controversy. Since 1970, a group of Native Americans stage a protest at Plymouth Rock, and American Indian Heritage Day is celebrated the Friday after Thanksgiving. We like the universal brand promise of a National Day of Gratitude. Few other countries have set a day aside especially to be grateful. We would do well to keep this brand promise, as it is through gratitude that we recognize and acknowledge our blessings as a nation. And it is through acknowledgment that we appreciate, protect, and grow our prosperity. Sure, the United States has its issues. But here we have bounty, opportunity, and education all delivered in an infrastructure unequaled in the world. Gratitude keeps it there! Lately, we have seen the Thanksgiving “brand” become denigrated with nicknames like “Turkey Day” as if that’s why we celebrate. We have seen the focus turn to feasting and away from the original intent of this national holiday, giving thanks. The Friday following Thanksgiving, dubbed “Black Friday,” has traditionally been the “official” beginning of the all-important Holiday Shopping Season. Consumer spending during the period between Thanksgiving and Christmas has become a predictor to the economic outlook for the following year. If holiday spending is up, it bodes well for the economy. So merchants offer all manner of promotions to increase sales during this critical period. In the past few years, however, we have witnessed a new assault on the very reason for Thanksgiving. Now holiday shopping starts on Thanksgiving Day itself, and has been tagged “Gray Thursday”! So, are we headed for simply a day off to eat turkey and shop? Having a non-commercial day to spend quietly with family and friends to acknowledge our blessings, regardless of our politics, race or religion, bonds us all as Americans. It gives us the “time out” George Washington had in mind to acknowledge and commit to preserving what we have as a nation. Taking it all for granted is the fastest way to lose it. Gratitude helps us appreciate what we have and focuses our attention on what we want to keep. Don’t you think the distracting pressure and anxiety of Christmas shopping can be postponed for just one more day? 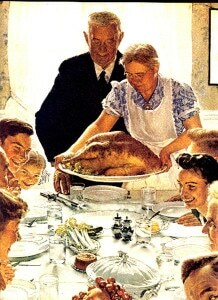 We as the general public are the owners of all brands, including Thanksgiving. Let’s protect the brand promise of Thanksgiving so that we may always live in a land of tolerance, freedom and plenty. Contemplate your blessings, and share the abundance of the season’s harvest with your family and friends. Enjoy a non-commercial day. Happy Thanksgiving everybody!